If you’re looking for ways to make mealtimes more innovative and for alternatives to bread or rolls, check out our RECIPE VIDEOS and kick-start a healthier food lifestyle for you! Why not give them a go yourself? Heat half the oil in a large frying pan over a medium-high heat. Add peppers and onion and cook, stirring for 5-6 minutes until golden and softened. Season well. Remove from pan and keep warm. Heat remaining oil in the pan over a high heat. Add steaks and cook for one minute per side until deeply coloured. Remove from the heat and leave for two minutes before thickly slicing. If you are always on the go or find shop sandwiches a bore then Deli Kitchen is here to help with options that meet your needs, whatever the day throws at you. Using fresh ingredients to create flatbreads that meet your needs, that are healthy and tasty, perfect for easy, quick and healthy meals. 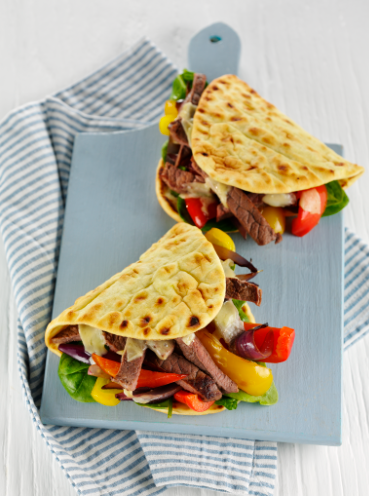 The Deli Kitchen range of tasty and innovative flatbreads was created to help carry you through your day in a tastier, more exciting way. We start each day with a “What if? We asked what if sandwiches could be tastier, healthier, less boring. We follow our curiosity and put ourselves in your shoes to create innovative flatbreads that relieve the boredom of everyday meals. We put our inventive, curious and slightly eccentric heads together & came up with a range of tasty, healthy and easy to use products.